The health of forests, people and our planet are intrinsically linked. Functioning as lungs of the earth, forests supply vital oxygen and enhance air quality. Forests also provide ecological functions such as wildlife habitat, nutrient cycling, and flood control and other environmental services. Read the entire article at Medium Upstream. On a global level, stewarding our forests is crucial when it comes to curbing carbon emissions. Deforestation and forest degradation increase CO2 concentration in the atmosphere, while intact and healthy forests function as carbon sinks absorbing one-third of carbon emissions worldwide or 2.4 billion tonnes of carbon per year. Yet, over 15.8 million hectares lost in tropical countries in 2017 alone. There is no doubt that the world’s forests are in major distress and protecting them is more crucial than ever. Several strategies can be implemented in the forestry sector to address climate change. One economic incentive scheme for reducing GHG emissions is commonly referred to as ‘reducing emissions from deforestation and forest degradation, plus the role of conservation, sustainable management of forests and enhancement of forest carbon stocks in developing countries’ (REDD+). By considering the economic value of ecosystem services provided by forests, REDD+ helps align economic incentives with environmental priorities. In this way, communities and countries are compensated for protecting valuable forest resources which ultimately have global benefits. However, a program which spans the globe requires consistent methods of monitoring. This is where satellites can help! Stakeholders involved in REDD+ processes need accurate and timely data on forests to make informed decisions about how best to steward and protect these valuable ecosystems. One of the key barriers preventing countries from realizing the full benefits of REDD+ is having a reliable measuring, reporting, and verification (MRV) system in place with realistic reference levels. MRV requirements must be fulfilled by the entity in charge of monitoring each target forest area to access funding. Unfortunately, in some cases developing countries lack the resources or capacities to fully develop, operate and maintain MRV systems to ensure their reliability. Transparent oversight and monitoring are critical for the success of REDD+ programs to conserve, restore, or manage forests for carbon storage and the provision of other environmental services. Innovative technology solutions help meet this need for efficient, scalable, and accurate assessment of target forests and surrounding areas. 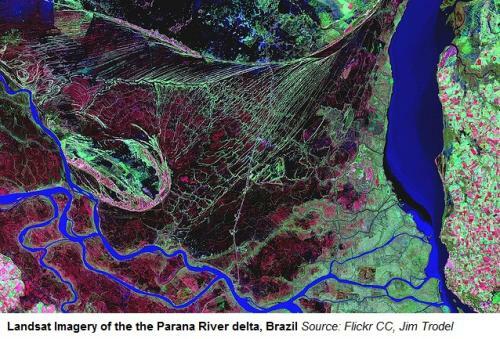 Satellites have captured data on forests and land cover for decades and continue to collect information on a daily basis around the world. The use of remote sensing and artificial intelligence enables automated mapping and monitoring at very large scales and high frequency. With access to these technologies, various stakeholders can verifiably quantify outcomes of REDD+ programs based on empirical evidence. Users can also track changes in forest cover as they occur and take action as needed. For decades, monitoring the world’s forests had been a challenging task, but innovative tools can now greatly facilitate that process. With up-to-date reliable, transparent and accessible data and MRV systems in place, countries will be able to identify where risks lie, prioritize actions, turn data into knowledge and generate verifiable reports on forest status. With this information, countries can be fairly compensated for emissions reductions from avoided deforestation and expanded forest carbon stocks. Ultimately, investing in forests is investing in our own future and that of our planet.